'Sustainability' has been defined as practices that "meet the needs of people today without compromising the ability of future generations to meet their needs." There is a great deal of discussion in design and construction circles on the topic, and widely varying opinions as to exactly how this can be accomplished. There is also much being written, with references too numerous to list here, but here are some good ones. The Wisconsin Green Building Alliance's (WGBA) mission is to facilitate and promote the development and use of ecologically sustainable materials and practices within Wisconsin's built environment. WGBA is an affiliate of the US Green Buildign Council. The U.S. Green Building Council is a non-profit community of leaders working to make green buildings available to everyone within a generation. The organization administers the Leadership in Energy and Environmental Design (LEED) certification of green buildings. Cohousing is a form of cooperative community that is resident developed and run, and which combines individual dwelling places with the advantages of community living. Design Coalition is a Sustaining Member of the The Cohousing Network. Katie McCamant, co-author (with husband Chuck Durrett) of the book Cohousing - A New Approach to Housing Ourselves, likens cohousing to "a custom built neighborhood". Pioneered in Scandinavia, cohousing has caught on in the U.S. in recent years, with hundreds of active groups at various stages of the housing development process. Cohousing Tools are worksheets and design & planning aids from workshops Desgn Coalition presented in the early 1990's. They are now available for downloading. For more on cohousing in Madison, Wisconsin, see our Village Cohousing project, the first of it's kind in Madison. Light clay is an amalgm of straw and clay used as a building material. It is called 'light clay' after the German leichlehmbau -- "light-loam-building" -- to distinguish it from various 'heavy' forms of earth construction which also contain earth and straw, such as adobe and cob. 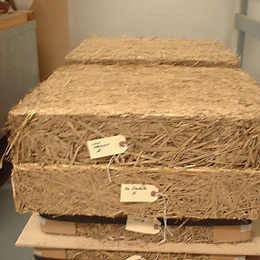 Straw clay is mostly straw, with only a small amount of clay used as a binder. The technique pre-dates strawbale building by many hundreds of years. For more on building with light clay, see our feature article, Natural Building Techniques. Pattern language is a concept first presented by Christopher Alexander and his co-authors in the book A Pattern Language (Oxford University Press, New York 1977). The authors identify 250+ patterns of elements and systems in the physical environment - the natural environment and especially the human-made environment. The essential premise of A Pattern Language is as follows: Humans shape their environment. When humans do any activity repeatedly, it generates a pattern in the physical environment that corresponds to that activity. Very basic human activities that are repeated often - such as eating, sleeping, working, learning, worshiping, courting, raising children and so on - generate strong and lasting patterns. Patterns can be 'alive' or 'dead'. That is, live patterns support us in living fully; dead patterns hinder us. Taken together, patterns can form a language of design. There can be many such design languages; the "truth" of any language is based in how well it expresses the heart of the matter, the wholeness of human-envirnoment relationships. We heartily recommend this book to anyone interested in planning or design, at any scale. For more, visit the Pattern Language website. "BuildingGreen brings the best research, thinking, and writing to you through many publications, including Environmental Building News, the GreenSpec directory of green products, and the BuildingGreen Suite of online tools." The Healthy Building Network's mission is to "transform the market for building materials to advance the best environmental, health and social practices." Their website offers information about the health and environmental impacts of building materials. The Minnesota Legislature required the Departments of Administration and Commerce, with the assistance of other agencies, to develop sustainable building design guidelines for all new state buildings by January 15, 2003. To achieve these goals, The State of Minnesota Sustainable Building Guidelines (MSBG) built on previous local and national efforts. A combination of the best traditional planning and modern technologies, New Urbanism emphasizes the power of good design to enhance the quality of our lives. It can assist in the design of appropriate land use patterns, growth limits, energy sources, environmental balance, and social integration. It's main goals include the restoration of community, the integration of social elements severed by suburban development, and the reconciliation of urban and natural environments. For more, visit the website of the Congress for the New Urbanism. And see our feature article about Traditional Neighborhood Design in a 100 year old Madison neighborhood. Above: Transect Plan by Duany Plater-Zyberk & Co.